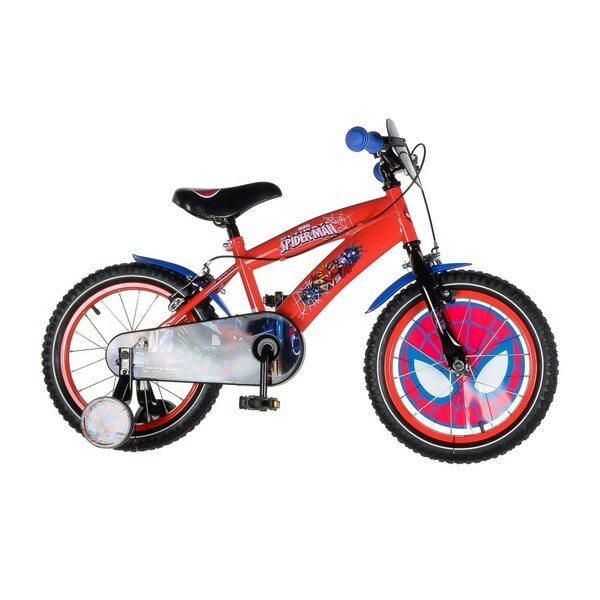 Get the perfect bike for your little superhero with the 16 Inch Ultimate Spider-Man Bike. The handlebar plaque features awesome Spidey graphics that young fans will love. Spider-Man himself gazes out from the front wheel insert, featuring classic Spidey design. 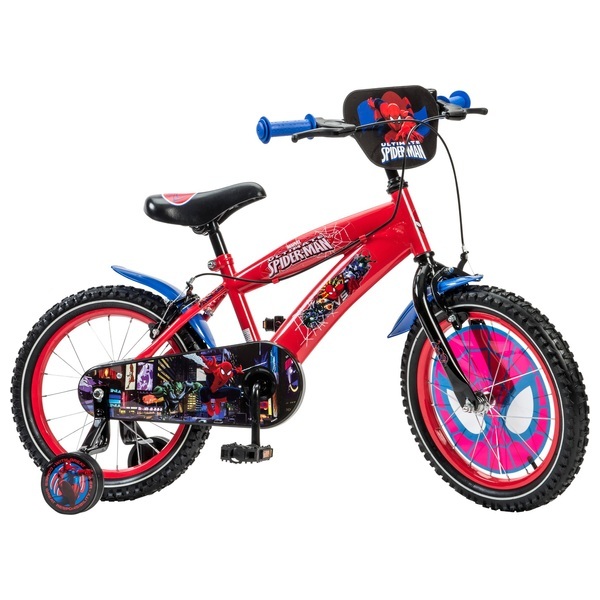 The 16 Inch Ultimate Spider-Man Bike features a fully enclosed plastic chain guard to protect your child’s fingers. The chain guard is printed with an epic image of Spider-Man in action in Times Square, while the strong and durable red steel frame and the comfortable black saddle both display graphics inspired by the Marvel universe. The bright blue mudguards and handlebar grips complete this bike’s classic Spider-Man styling. Removable stabilisers are included with the 16 Inch Ultimate Spider- Man Bike. These will help your child to develop their balance and coordination skills before they progress to cycling unaided—and the classic Spider-Man quote in the graphics might even inspire them! The stabilisers are easy to removeas your child’s cycling skills develop and they begin to cycle on two wheels. The 16 Inch Ultimate Spider-Man Bike is equipped with front and rear caliper brakes for your little cyclist’s safety and the tyres are air pumped. The fixed gear simplifies cycling for young riders. Helmet and potection set all sold seperately.